Apple’s business rolls along like a well-oiled machine, in part because its executive team has been largely home-grown and internally developed for years. Two recent hires suggest that is changing under Tim Cook. Is Apple going on an overseas talent shopping spree? The company’s just hired Robin Burrowes to head up marketing for the iTunes App Store in Europe. Executive-level hiring happens all the time, but Burrowes is different: Until now he’s been leading Xbox Live marketing for Europe, the Middle East, and Africa. In other words: He’s a Microsoftee. Along with Apple’s brand new SVP of Retail John Browett–a British marketing expert, previously chief exec of European tech retail chain Dixons–it looks like Apple’s breaking with its long-held tradition of hiring executives from inside its number. Burrowes’ expertise could be a great asset to Apple. Burrowes was at Xbox Live during its recent rapid growth (signing up a new user every two seconds has to be a win) and Europe is a core market. The App Store is populated with tens of thousands of games, and these styles of apps are key to Apple’s future revenues, meaning Burrowes is an ideal fit. But Browett is a slightly more controversial hire. The struggling British tech retail store chains he led are not at all famous for the classy, minimalist, and customer-forward style of the Apple Stores. They are better known for garish colors and a pile ’em high, sell ’em cheap showroom philosophy. Undoubtedly this means Browett has a different perspective, but Tim Cook has allegedly stepped up to defend the decision. Apple’s executive team is typically made up of long-timers who have been grown inside the company before landing a top job. For example, former SVP of retail Ron Johnson, who is largely responsible for the global retail success of the Apple Store, was with the firm for 10 years. Now, assisted by a talent search firm, the company has made two high-level hires from outside its ranks, and with overseas expertise. This is Tim Cook stamping his mark on Apple, of course, perhaps because he has a vision for a future where external expertise helps take Apple in new and interesting directions. There’s also a ghost of Steve Jobs in these decisions, because he was responsible for bringing the executive talent scouts aboard (Jobs wanted to “consider executives who are based abroad”). Perhaps Jobs himself was sensitive to change, Apple’s growing global importance, and the idea that newer thinking may be needed in the future of a company he knew he wouldn’t be managing. So this isn’t the changing of the guard, nor is it particularly dramatic. But Apple watchers, both amateur and on Wall Street, may be keeping a close eye on these developments because they could signal Apple gently steering itself in a new direction. 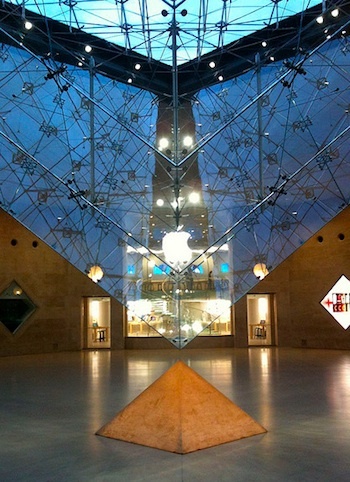 Perhaps the next iPhone may even get a Paris launch event, rather than a U.S. one. No, who are we kidding? Apple’s still as American as apple pie (except when it comes to jobs creation, of course). The launch will be in San Francisco, and may even come in June…but that’s another story.